I would like to point out that the University of Michigan ranks among the top 15 finest universities in the world. Academically. We are talking about academics here. As an alum, I feel obliged to establish this fact at the outset. Now we can talk about football. Perhaps you have heard about the incident last Saturday during the Michigan-Minnesota game (final score: we do not speak of it), in which quarterback Shane Morris took a hard hit to the head, staggered around, was escorted off the field, and then, a few plays later, to the astonishment of the fans, was sent back into the game for one play. Why none of the coaches or sideline trainer-medical types saw him wobble, or evaluated him for concussion before sending him back out (with an injured ankle, too)—no one can explain, and these mysteries have accelerated the slow, painful implosion of the Michigan football program’s reputation, and maybe the program. The president of the university is attempting to salvage a situation that was exacerbated by delayed and dissembling communications from the athletic division. Meanwhile, Go-Blue pundits are hoping for the imminent departure not only of head coach Brady Hoke but also athletic director David Brandon, who is increasingly depicted as a mustache-twirling villain. In fact, “departure” may be too mild a term for what may happen to these guys and members of their staff. As my husband keeps telling me, this is Michigan football we’re talking about, and the villagers are sprinting out to their toolsheds for pitchforks and torches. At the very least, Michigan students staged an old-fashioned sit-in Tuesday on President Schlissel’s lawn, calling for Brandon’s removal. Can Michigan football be saved? Maybe. But I wonder, honestly, if this is just another tremor in a major cultural shift. 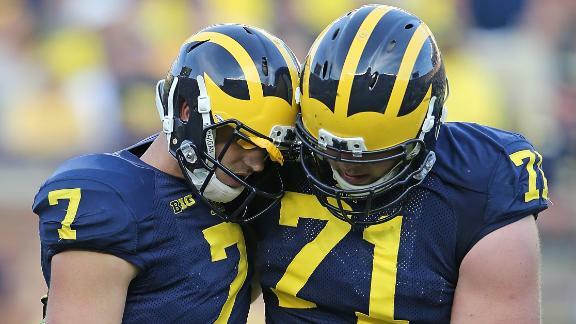 I wonder if we are witnessing the end of an age, not just for Michigan but for football at all levels. The NFL grapples with mounting evidence about the long-lasting effects of repeated head injuries. And just this week, three high school players died—died—from head injuries suffered, at least allegedly, from football-related impacts. Maybe we shouldn’t bother to try saving football. Maybe we should just let it go. I realize this is easy for me to say because, although I enjoy watching Michigan football on fall Saturdays, my life would hardly change if it all went away. In fact, after the Michigan-Notre Dame game on September 6 (final score: we do not speak of it) my Saturdays seem to have opened up this fall, and I’m happily filling up those four hours a week with gardening, reading, laundry, and (well, to be honest) more paper grading. However, football is so embedded in American culture, it will not be easy for many others to extricate it from their lives. So with patriotic altruism for my fellow Americans, I have been thinking about possible substitutes for football, substitutes that might serve many of the same important cultural needs. Some modest proposals, then, organized by the cultural need they could fulfill. How about eliminating the football part and concentrating only on the marching bands? Crowds could gather in big stadiums and watch marching bands from rival schools compete. We could easily repurpose the commentators, the television broadcast technicians, the whole commercial apparatus. We could import judges from all those TV competition shows. Marching band smack-downs would still involve plenty of color and noise, crowd cheering, trash talking—and no one gets hurt. Well, at least if we can eliminate the hazing and corruption that already beset top university marching band programs. Oh well. Maybe with more attention and popularity, band program troubles will be better monitored! Anyway, imagine what this would do for K-12 school band programs. Competitive parents would be starting their kids on clarinet at age 3! To regulate the potentially savage business of eating meat. To bring people together in a community. And to support and elevate the priestly class in charge of it. So if the football tailgate party dies, we will obviously need a substitute to satisfy our need for meat-intensive Dionysian rituals. I’m going to suggest that we return meat-grilling to its religious roots and start holding gigantic barbeques after church every week in the fall. The more granola churches like mine, with our high percentage of vegetarians, will have to provide options, of course. But even those who eat the bean burgers can feel their primitive human impulses sated when they inhale the smell of bratwurst. I have already championed the idea of bringing back jousting—sort of like football distilled down to nothing but crashes and injuries, except with horses. Sadly, the competitive jousting show didn’t last, but we might still be able to learn something from the competitors. A number of them were theatrical jousters, making a living on the Renaissance Faire circuit. What if we were to switch to theatrical football? All the tackles and runs and even the interceptions would be choreographed, and no one would really get hurt. Suddenly, high school theater geeks would be popular, because they would be good at sports, because they are good at acting! In fact, if this idea caught on, we could even add musical numbers. I would not be surprised, should football fade into memory, if we experienced a corresponding increase in the number of people attending comic-con events just to see men in superhero outfits. No problem here. Americans already use almost every holiday for this purpose. No problem. We already have Downton Abbey. Oh fine. Or The Ultimate Fighter. There’s always golf, which also goes on for hours and involves hundreds of ads. I’m not claiming this will be easy. But I have faith that American culture will survive somehow even if the Age of Football is coming to an end. Meanwhile, my undergrad and grad-school alma maters are playing each other today (Michigan vs. Rutgers). I could regard this as a surefire win for me either way, but I’m still more loyal to Michigan. So I’m predicting right now that whatever the final score may be, I will not speak of it.